Be the first to share your favorite memory, photo or story of Buena. This memorial page is dedicated for family, friends and future generations to celebrate the life of their loved one. 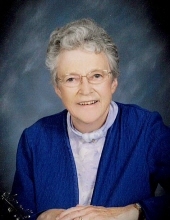 Buena Ruby (Eng) Anderson died Sunday, April 7, 2019 in Richland Center, Wisconsin. She was born on January 20, 1927, on the Eng Farm in Akan Township, Richland County, Wisconsin to Oscar and Adeline (Sutton) Eng. Buena graduated from the Richland Normal School, in 1946 with her teaching degree, then taught in two one-room schools, the Gault Hollow School in Eagle Township and the Hanson School in Richwood Township. On June 3, 1947, Buena married Harden “Honk” Anderson at Five Points Lutheran Church. They began farming on the Anderson family farm in 1949 until 1988, it became a century farm in 1986. While helping with the farming, Buena also was a seamstress, sewing professionally for people in the area. She made many wedding and bridesmaid dresses for many area weddings. Together, Buena and Harden had five children: Charles (Sheelah) Anderson, Louisville, KY, Lynn (Pat) Harwick, Richland Center, WI, Donald Anderson, LaCrosse, WI, Thomas (Jan) Anderson, Normal, IL, and Kay (Jim Nuttall) Anderson, Rhinelander, WI. Buena also leaves eleven grandchildren, Abbe Michalski, Jeff (Patty) Anderson, and Lori Anderson; Tammy (Joel} Hornby, and Scott (Michelle) Harwick; Chris (Michelle) Anderson; Kurt (Marjorrie) Anderson, Kristen Anderson, and Erik Anderson; and Ethan and Ryan Roberts; twelve great-grandchildren, Rusty Michalski; Cassandra, Becky, Seth and Andrea Hornby; Alanna and Alexis Harwick; Siri, MacKenzie and Meren Anderson; Nilo and Perla Anderson. She was preceded in death by her husband, 2 brothers, 3 brother-in-laws and 2 sister-in laws. She is survived by 3 sister-in-laws and many nieces and nephews. Funeral services will be held at 11:00 AM on Saturday, April 13, 2019 at Five Points Lutheran Church with burial to follow in the Five Points Cemetery. Visitation will be held at the Pratt Memorial Chapel on Friday, April 12, 2019 from 4:00 PM until 7:00 PM and again at the Five Points Lutheran Church on Saturday, April 13, 2019 from 10:00 AM until the time of service at 11:00 AM. In lieu of flowers the family suggests memorials be made to the Five Points Lutheran Church, 25925 Fivepoints Dr, Blue River, WI 53518 or Richland County 4H Leaders Association, 4H clothing scholarship, 1000 Hwy 14 West, Richland Center, WI 53581. The Pratt Funeral and Cremation Service is assisting the family with arrangements. Online condolences may be made at prattfuneralservice.com. To send flowers or a remembrance gift to the family of Buena Ruby Anderson, please visit our Tribute Store. "Email Address" would like to share the life celebration of Buena Ruby Anderson. Click on the "link" to go to share a favorite memory or leave a condolence message for the family.